New to our store are Twinkly smart string lights. These LED lights are quite possibly the coolest thing ever! If you are the competitive type, these lights will help make your Christmas decorations standout above the rest of the neighborhood. With Twinkly lights, you can create a dynamic display of color. 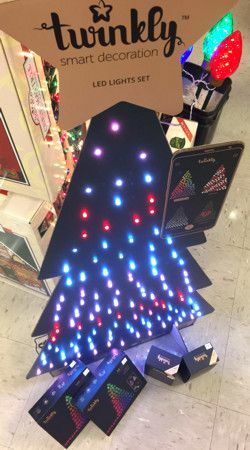 These LED string lights can be displayed on your tree and then programmed to create a fascinating display. If you are using the lights outside, you might prefer the freehand settings, which allow you to wrap and string the lights any which way you would like. This is great for outlining your home or looping them around trees or shrubs. And don't worry about the "programming" part... because this step couldn't be easier! To program the LED lights, simply download the twinkly app to your smartphone and then "pair" the string lights to your phone with the included wifi network. Once downloaded, you can view all of the different lighting options and choose the one that works best for you. Want to switch it up next week? That is no problem either, just open up the app and switch the color and pattern instantaneously. It is really quite astonishing everything that this product can do. Please view the video below for a better understanding of what options are available! Stop by our Christmas department and ask for a demonstration of this product! To purchase, you must start with a starter kit, but then you can add on to it as many add-on strings as you would like. The result can be a very large display.